What is the crystallization material and how can I get it? Middle school students and home-schooled youths (ages 11-13/14) will grow crystals of alum, KAlSO4.12H2O (potassium aluminum sulfate, dodecahydrate). High school students home-schooled youths (ages 14-18) will grow crystals of cupric sulfate pentahydrate CuSO4.5H2O. Middle school teachers will grow crystals of potassium dihydrogen phosphate (KH2PO4; KDP). High school teachers will grow crystals of potassium dihydrogen phosphate (KH2PO4; KDP). The 2019 Handbook describes the crystallization procedures applicable to all three compounds. The crystal growing period is from March 1 to April 30, 2019. The judging will take place on May 10, 2019 by a panel of judges. The following crystallization information is also available as a PDF. RULE 2: So that all students have an equal preparation time, crystal production must conclude within six weeks after receipt of starting material. Check out the three videos by Prof. Jason Benedict (University of Buffalo): introduction, part 1(how to grow a seed crystal), part 2 (how to grow a large crystal). Watch a YouTube video that tells you how to grow a crystal with Johanna! Now you are ready to proceed with the preparation of a large single crystal. Once you have mastered this step, you may be interested in trying to grow single crystals in the presence of introduced ‘impurities” that may give different crystal colors or shapes. In recrystallization, one tries to prepare a solution that is supersaturated with respect to the solute (the material you want to crystallize). There are several ways to do this. One is to heat the solvent, dissolve as much solute as you can (said to be a “saturated” solution at that temperature), and then let it cool. At this point, all the solute remains in solution, which now contains more solute at that temperature than it normally would (and is said to be “supersaturated”). This situation is somewhat unstable. If you now suspend a solid material in the solution, the “extra” solute will tend to come out of solution and grow around the solid. Particles of dust can cause this to occur. However, this growth will be uncontrolled and should be avoided (thus the recrystallization beaker should be covered). 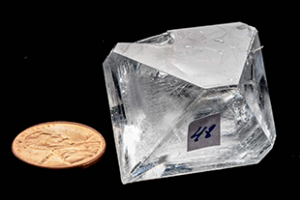 To get controlled growth, a “seed crystal”, prepared from the solute should be suspended into the solution. The supersaturation method works when the solute is more soluble in hot solvent than cold. This is usually the case, but there are exceptions. For example, the solubility of table salt (sodium chloride) is about the same whether the water is hot or cold. 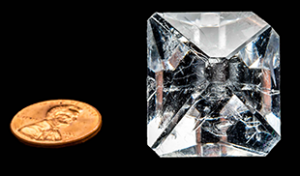 The rate at which crystallization occurs will affect crystal quality. The more supersaturated a solution is, the faster growth may be. Usually, the best crystals are the ones that grow SLOWLY. Thus, if you heated the solvent to near the boiling point to get a highly supersaturated solution on cooling back to room temperature, crystals may start to form before the solution had completely cooled. This is where the “art” of science comes into play. One has to experiment a bit to get the right conditions. A second way to get supersaturation is to start with a saturated solution and let the solvent evaporate. This will be a slower process. Warm this water to about 15-20 deg above room temperature. Each school is encouraged to submit one crystal for best quality and one for best overall. It is recognized that several crystals from a school may be of roughly equivalent overall quality. If this is the case each school may submit several crystals. Potassium dihydrogen phosphate is safe but the usual safety precautions should be exercised. Gloves and goggles are recommended. The SigmaAlrdrich Safety Data Sheet for potassium dihydrogen phosphate provides exhaustive safety information. Potassium aluminum sulfate, dodecahydrate is safe but the usual safety precautions should be exercised. Gloves and goggles are recommended. The SigmaAlrdrich Safety Data Sheet for potassium aluminum sulfate, dodecahydrate provides exhaustive safety information. Cupric sulfate pentahydrate can be purchased from Flinn Scientific or Farm & Fleet. The SigmaAldrich Safety Data Sheet for cupric sulfate pentahydrate provides exhaustive safety information. The crystallization materials for the competition are purchased from Flinn Scientific.